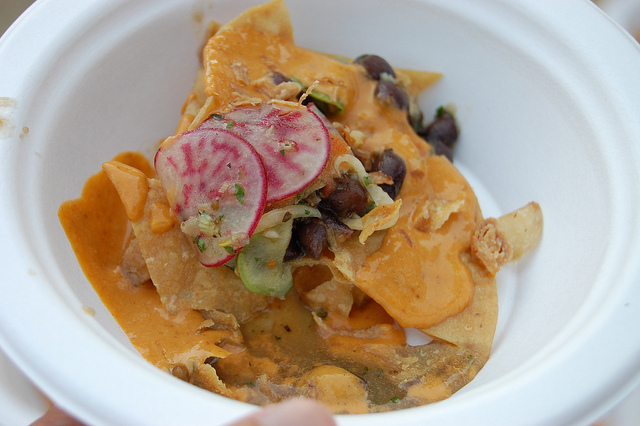 Taste of Chicago closed Sunday night and while the check hasn&apos;t hit the table yet, the grandaddy of all food fests has received mixed reviews, including mine. The reports don&apos;t mention a beloved event that&apos;s been held around the same time for a dozen years and known arguably as the real Taste of Chicago: the Green City Market Chefs&apos; BBQ. The numbers can&apos;t compare, with Taste&apos;s millions of attendees and the BBQ&apos;s 2,200. Plus Taste is intended as a profitable event for both the city and vendors, while the BBQ is a benefit. Neither can be the other, but for sheer culinary artistry, and both outdoors, the relatively little BBQ towers over Taste. One number merits comparison. 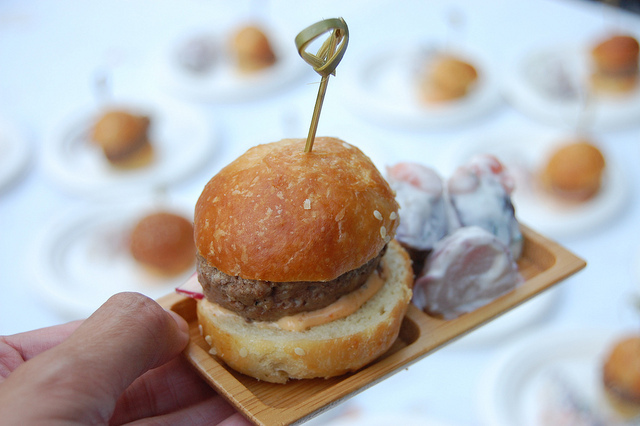 This year&apos;s Taste scaled down from nearly 60 vendors to only 40, while the BBQ program lists 101 chefs — plus cocktails, beers, wines, cider, coffee and tea. The actual number was as hazy as the smoke that hung over Lincoln Park, since some teamed up and offered more than their expected menus, and all used primarily product from the market. The one night only fête is the Green City Market&apos;s "largest fundraiser and supports the market and its educational initiatives including chef demos, Club Sprouts, Edible Gardens, farmer education programs, Heirloom and Heritage Project, annual Locavore Challenge, [and] Savor the Seasons festivals." Food on sticks. You&apos;ll find more at state and county fairs, but not the Dothraki amuse-bouche that was The Butcher & Larder&apos;s intensely flavorful grilled chicken heart. Also tasted: Spiaggia&apos;s carne salata (Calabrese style cured beef carpaccio) on an edible breadstick and Pecking Order&apos;s Filipino style chicken BBQ. Asian-ish. 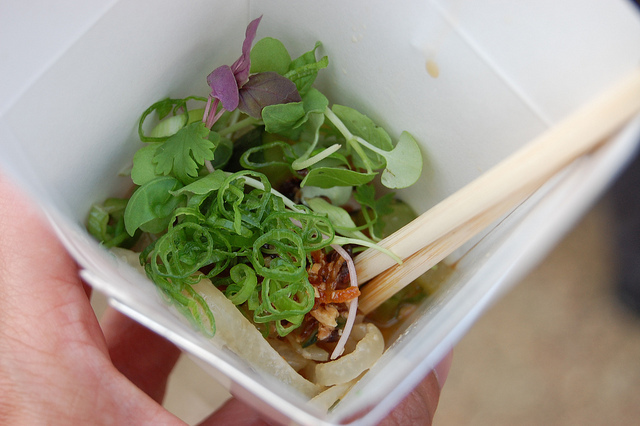 Which leads me to this notable trend, not only Embeya&apos;s lemongrass beef and lettuce wrap, but Trenchermen&apos;s pig skin noodles, actually served in a Chinese take-out box with chopsticks. Also tasted: Perennial Virant&apos;s duck sausage, Red Door&apos;s bulgogi glazed spareribs, Big Bowl&apos;s Asian BBQ pork and Yusho&apos;s robata tofu. Vegetarian. 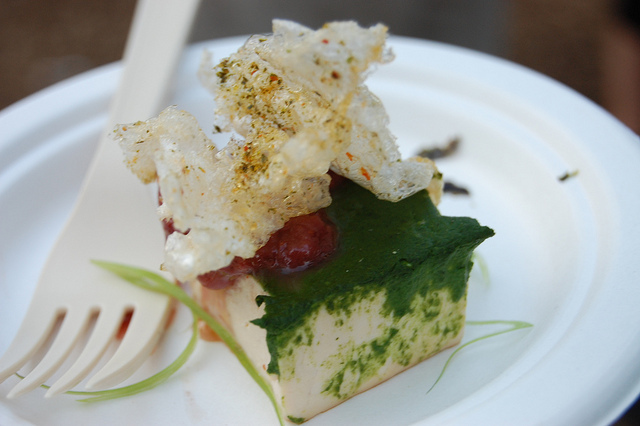 The tofu was one of 29 veg dishes, nearly a third at what was once a meatopia. 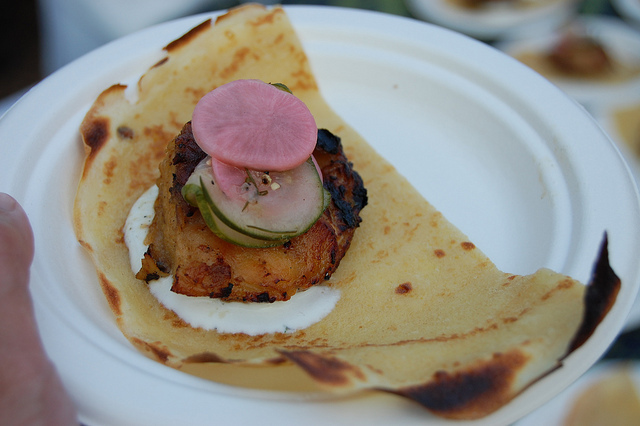 Also tasted: Nellcôte&apos;s grilled flatbread, Boka&apos;s cucumber salad, City Provisions&apos; couscous salad, Zealous&apos; ricotta tart, Quince&apos;s beet salad and Browntrout&apos;s falafel dog. Lamb. OK, it&apos;s still a meatopia, especially lamb, many in encased meat form, including Sepia&apos;s gorgeous spicy merguez. 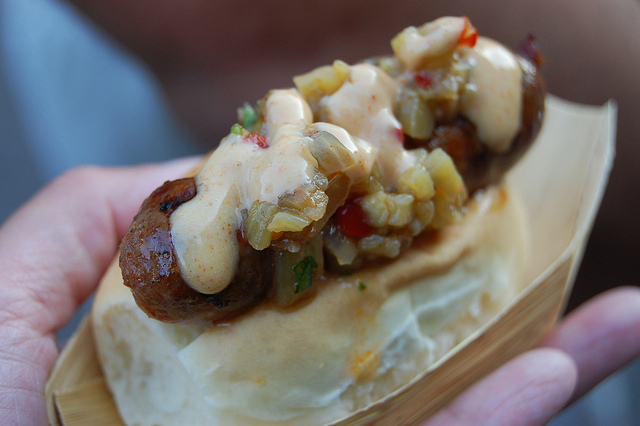 Also tasted: Old Town Social&apos;s mini lamb hot dog, Vie&apos;s lamb salami, 676&apos;s lamb hot link and Stout Barrel House&apos;s lamb al asador. Fancy burgers. It&apos;s not a chef BBQ without fancy burgers, and Café des Architectes merges two trends with mini lamb burgers plus a surprising side of smoked salmon potato salad. Also tasted: Sunday Dinner&apos;s goat&apos;s cheese burger and Balena/The Bristol&apos;s cheeseburger on housemade potato bun. Surf and turf. 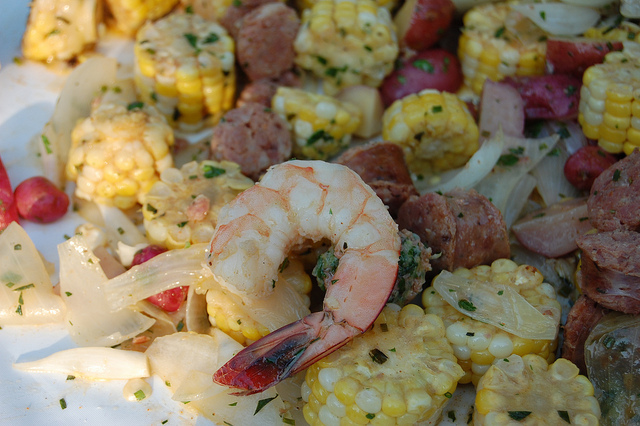 Make that three trends, as did upcoming Carriage House&apos;s lowcountry boil, aka Frogmore Stew, after the South Carolina town origin story. Corn. 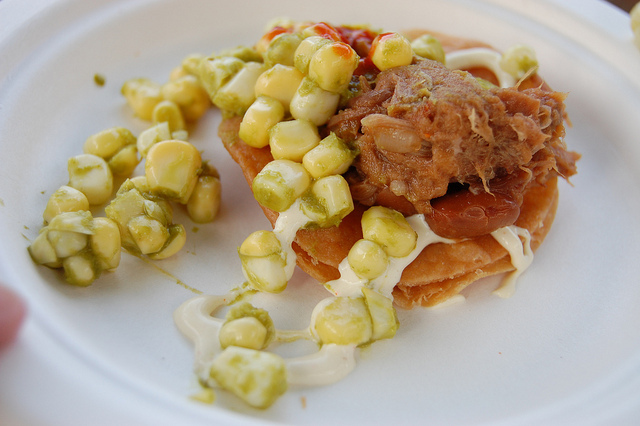 With the dire news about this year&apos;s corn because of the drought, it was almost like finding gold on Girl & the Goat&apos;s goat tostadas. Also tasted: on Sable&apos;s smoked duck, with Benny&apos;s glazed bacon and MK&apos;s roasted elotes. Stoner food. The elote could be classified as a gourmet street food trend, but new Blackbird pastry chef Dana Cree described Urban Belly/Belly Shack&apos;s black bean salad as stoner nachos so I&apos;m borrowing that. Also tasted: Allium&apos;s beef hot dog and chili cheese chips. Mexican-ish. The crossover continues with avec/Big Star/Blackbird/Publican/Publican Quality Meats&apos; beef barbacoa. 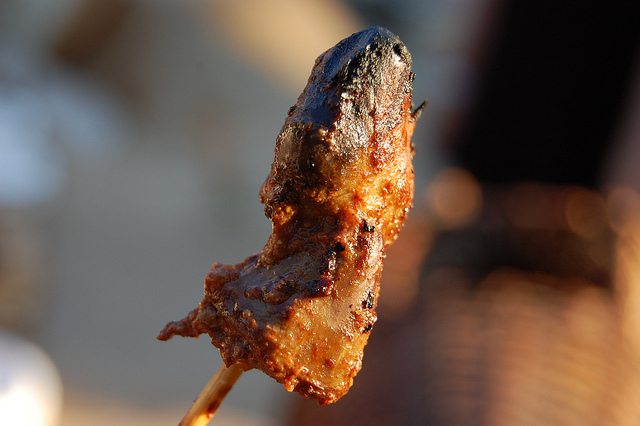 Barbacoa, traditionally made with a whole pig, is considered the original BBQ. Old meats new. But there were new takes on classic meat preps too, like Terzo Piano&apos;s elegant yet substantial chicken leg crespelle. 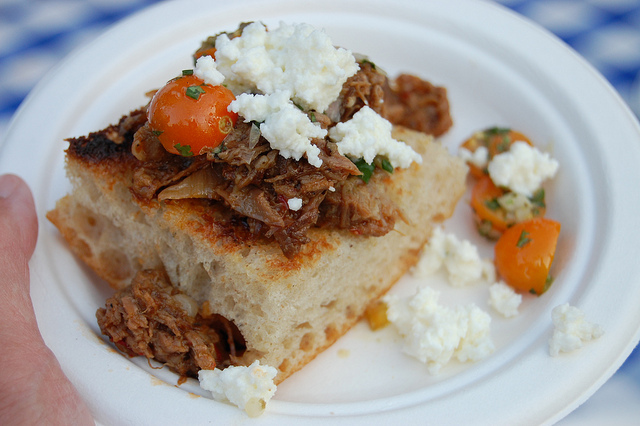 Also tasted: Socca&apos;s smoked Red Wattle, Ina&apos;s/Smoque&apos;s pastrami sandwich, and Limelight Catering&apos;s pork shoulder. Fish. And there was stunning fish, one of my favorite tastes of the night was Inovasi&apos;s silky smoked walleye with radish, spearmint, and barbeque sauce. 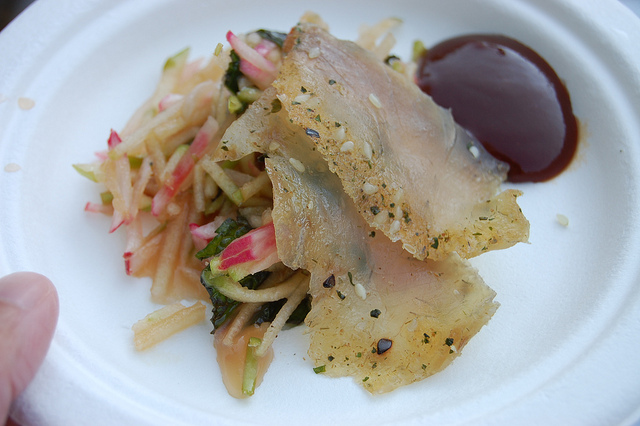 Also tasted: Dirk&apos;s grilled walleye taco, Marion Street Cheese Market&apos;s whitefish ceviche and Farmhouse&apos;s smoked trout. Modern art. 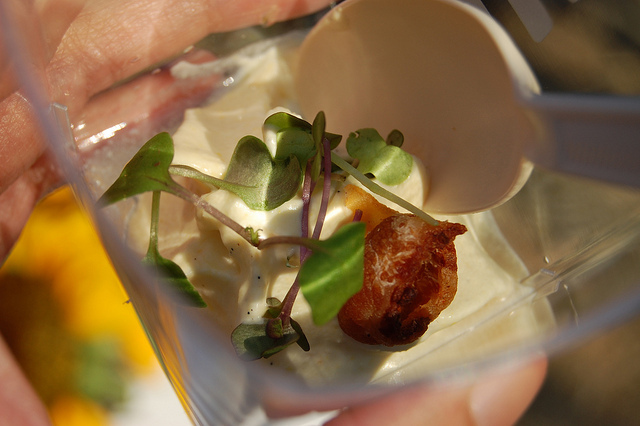 So many of the dishes were beautiful but a few truly stood out in not only their plating, but also creativity, including Atwood Café&apos;s warm corn, vanilla, tomato water, and tobacco gelée with crispy housemade guanciale. Also tasted: The Signature Room&apos;s smoked Superior trout with wasabi chip, Uncommon Ground on Devon&apos;s uncommon chilled BLT and Moderno&apos;s chilled cucumber melon soup. Desserts. 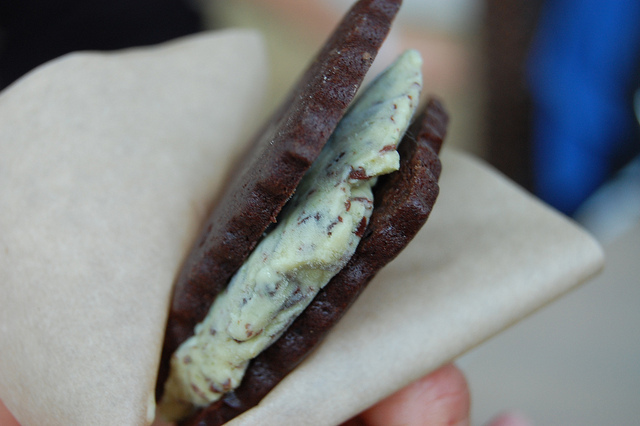 What was once an afterthought was now a star of the show — and perhaps deserves a show of its own like Green City Desserts — like Hot Chocolate&apos;s made-to-order ice cream sandwich. Also tasted: Benny&apos;s chocolate pudding cake, The Chopping Block&apos;s grilled apricot, Nightwood&apos;s strawberry shortcake blizzard, Uncommon Ground on Clark peach pot de crème and Sepia&apos;s summer fruit salad with cookies. Drinks. As could Green City Cocktails stand alone. 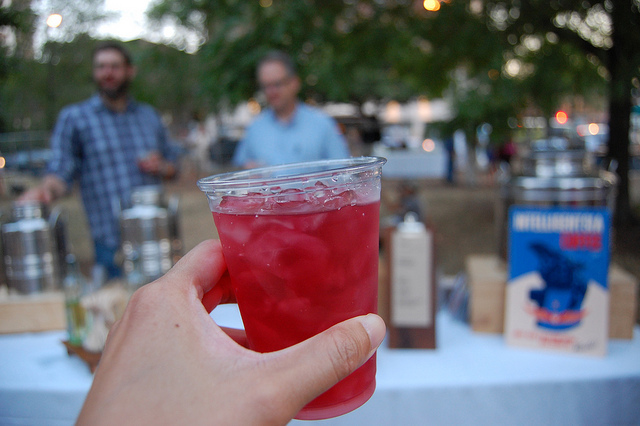 It was impossible to taste all the beverages, though I could have sipped Intelligentsia&apos;s iced tea all night long. To view all my photos as a slideshow click here. To see some of what I missed, check out the galleries by Anthony Todd at Chicagoist, Nick Kindelsperger at Serious Eats and LTHForum.com.